Dark matter is thought to account for about 85% of the mass in the Universe. Although the gravitational evidence for dark matter is by now overwhelming, it is still a daunting task to uncover its physical nature. Over the decades, many theoretical models have been proposed. I will start with a brief review of the evidence and of the most convincing models for particle dark matter. 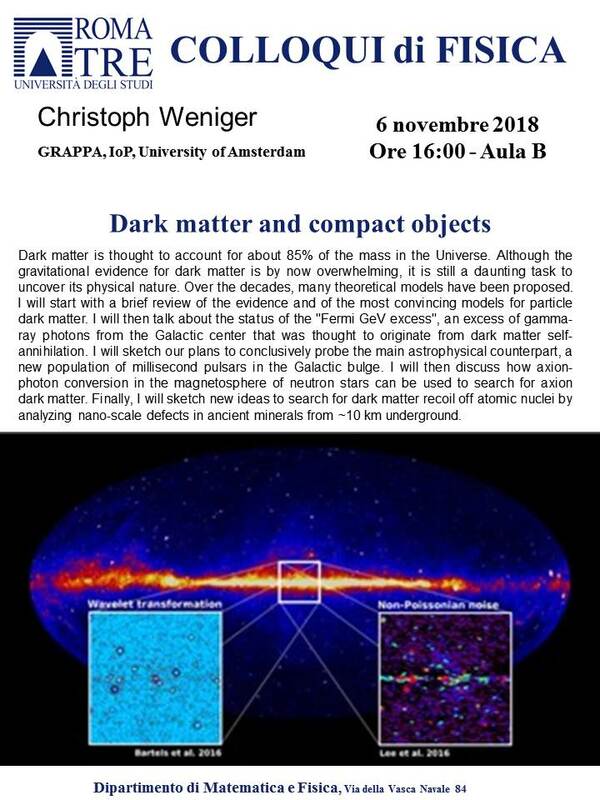 I will then talk about the status of the "Fermi GeV excess", an excess of gamma-ray photons from the Galactic center that was thought to originate from dark matter self-annihilation. I will sketch our plans to conclusively probe the main astrophysical counterpart, a new population of millisecond pulsars in the Galactic bulge. I will then discuss how axion-photon conversion in the magnetosphere of neutron stars can be used to search for axion dark matter. Finally, I will sketch new ideas to search for dark matter recoil off atomic nuclei by analyzing nano-scale defects in ancient minerals from ~10 km underground.